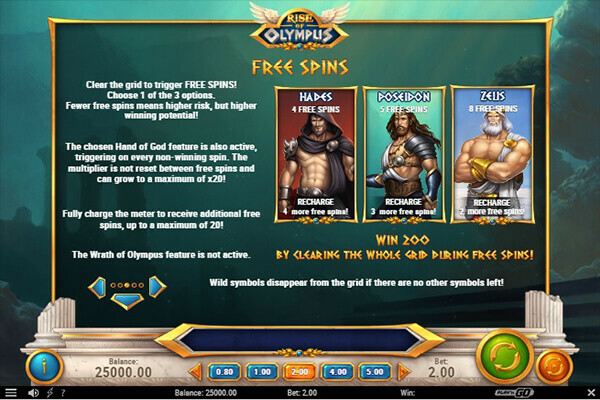 Meet Zeus, Poseidon and Hades in Rise of Olympus slot brought to you by Play’n Go. Themed on Ancient Greece and its mythology, the video slot tells the story of three powerful gods who will join forces to help you win big. This new online slot released in the end of 2018 uses a 5×5 grid with no paylines. You have to land 3 or more symbols in a row horizontally or vertically to win a prize. Feature-rich, the slot benefits from Wilds, random base game extras, the Wrath of Olympus bonus round and a highly exciting free spins feature where you can choose from three options with a multiplier increasing up to 20x. Get ready for plenty of action with mighty gods boosting your winning chances! No paylines. You don’t have to worry about landing matching symbols on paylines, all you have to do is to align them vertically or horizontally, regardless of their position. Multiple bonus features. We particularly love the fact that the game offers random bonus features that can be triggered on any non-winning spin during the base game to provide you with an additional chance of winning. With each cluster you create, you will have an additional chance of winning and a multiplier will increase by 1. Free spins options. You are offered to choose from three options according to your preferences. High payouts. A maximum possible win stands at 5,000x your total bet. Great visuals and sounds. High-definition graphics with the animated gods standing on the right side of the screen are accompanied by an intriguing dynamic soundtrack. You like slot machines that offer straightforward gameplay and this one may seem a bit overwhelming with all bonus features on offer. Mediocre payouts in regular play. You have to rely on bonus features to win bigger prizes. High volatility. This may not be suitable for all kinds of players. Rise of Olympus comes loaded with bonus features, so you can expect the action-packed gameplay. Whenever you create a win, winning symbols will be removed to leave a place for new ones to fall in. The golden coin stands for the game’s Wild. Each winning combination completed with no Wilds will generate new Wild in the middle position and increase a multiplier by 1. Activated on non-winning spins during the base game, the feature depends on an active god at the moment of its triggering. Hades will choose one of the symbols to transform it into another symbol, Poseidon will add 1 or 2 Wilds to the grid while Zeus will destroy 2 sets of symbols and remove them from the reels. Create winning combinations with gods to fill the meter and once you manage it, the Wrath of Olympus feature will be triggered. One free spin is awarded with all three Hand of God features playing consecutively. It takes time and patience to trigger the feature as you have to clear the grid completely to enter free games. Once you do it, you will be offered to choose from three options: Hades awarding 4 free spins, Poseidon awarding 5 free spins or Zeus granting 8 free spins. Each of the options comes with a respective Hand of God feature with consecutive wins increasing a multiplier up to 20x. Up to 20 free spins can be won in a single session and if you clear the reels within the feature, you will win 100x your total stake on top of your regular prizes. Keep in mind, the fewer spins, the higher risk and winning potential! Although it may strike you as a bit complex, Rise of Olympus is a must-play game. It will keep you engaged during both the base and bonus game thanks to highly exciting bonus features. We haven’t been lucky enough to trigger free spins where the biggest prizes can be won, but in the base game, we hit a series of wins worth 20x and 30x our total stake. Give the Play’n Go title a try and see what Greek Gods have in store for you!